Area S-9 is the ninth course of Rainbow Summit and the eighty-second course overall in Mario vs. Donkey Kong: Mini-Land Mayhem!. One Mini Mario begins at the middle left while another begins at the top center and the last one begins near the bottom right, with the exit door on the top right. In order to reach it, they must simply be guided via a series of Blue Ladders to it. The M-Token is located near the top top left, atop a platform only accessible via Blue Ladder. To collect it, a Mini Mario must simply use a Blue Ladder to reach up there while heading left. The Mini Mario Card is located at the very center, between two Blue Ladder rivets. 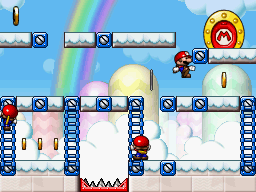 A Mini Mario must use the Blue Ladder directly to the right while heading left to reach it.